You’ve probably seen her grace your TV screen in Made In Chelsea, or perhaps you read her fashion blog? 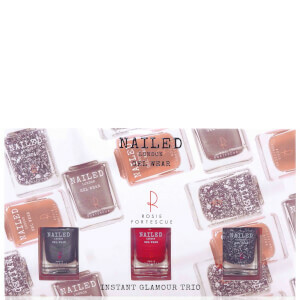 Rosie Fortescue is now the founder of revolutionary nail range Nailed London. Her interest in fashion saw her looking for long-lasting, salon quality nail polish in a range of fun and fashionable shades, so she did what any young, passionate woman would do, and went out there to create a line herself! Nailed London comes in 28 different catwalk inspired shades and uses a gel-like formula to deliver that all important long lasting mani. Their patented 3-step system was developed to closely match the look, feel, wear and gloss of professional gel polishes in the comfort of your own home. With glitter effect polishes, top coats and base coats, the collection from Rosie offers everything you need for an on-trend, professional looking mani.